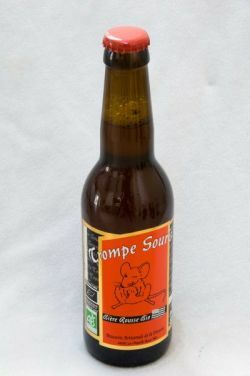 Nez: Malté, caramel, floral Bouche: Maltée, caramel, terreuse, florale, aqueuse Une bière sans grand intérêt. Bottle, 33cL. Home. A sparkling amber clear beer witha medium white head ; ok retention. Roast, light caramel, dried fruits. Light to medium sweet, light dry bitter refreshing. Light to medium body, thin texture, average carbonation, sweet roasty finish. Overall, enjoyable. Ámbar, poca espuma y algo turbia. Aroma muy marcado de los lúpulos, herbal, té... Suave en boca e igualmente muy aromatizada y frutal. Mas seca que la rubia pero igualmente apreciable. Bottled. Cloudy amber color, short head. Aroma of some malt, caramel and toffee, bit flowery (anis or lavender? buckweed?). Slight sweet taste, bit dry. Ok for a French amber. Amber colored brew. Fruity, slight malty aroma. Flavor has malts, some fruits and yeast. Fine, especially for an amber from France. Amber color. Yeasty aroma. Caramel and bitterness, but weak body structure. Not interesting.